Aloha! Years ago, I was on the search for an easy jazz standard to learn. I had tried and failed at so many before and it was always a frustrating experience. But then I found a transcription of “It’s Only A Paper Moon” (which is my wife’s favorite song, so I was familiar with the tune) and it was broken down two different ways: There was a single-note transcription for beginners and then there was the chord melody version. I learned the single-note version first (obviously) and then, as I became more comfortable with the song, started to incorporate the chords into the song. Sometimes it was difficult and I backed off, but after a while I had it nailed (but kept the single-note run for the bridge to give it more of a guitar solo feel). Because I knew the single-note version, I never became too frustrated when I was learning the chords because I could always revert to the single notes. The song would stay the same and it didn’t have the catastrophic crumbling that a song would normally have when you don’t know the next chord and that turned out to be a huge inspiration. I wish all instruction was like this. And then I found Jazz Guitar Christmas by George Ports from Centerstream. It breaks down thirteen Christmas songs (a favorite genre of mine) into two versions: easy and harder. It’s not single-note transcriptions, but it also isn’t very difficult. Even the graduated version doesn’t veer too far into the impossible and the harder one is built on top of the easy transcription meaning that you’re still going to hit those same notes as before, but they’re incorporated into bigger chords or there are some more notes between them. Honestly, I could see how some people would think that there is some wasted potential here because two version of thirteen songs could easily be twenty-six songs, but I think this is a solid way to learn new material. You make it as easy as you can to get the student into the tune and practicing it for fun, and then you build on top of that with more difficult material, but now they have a safety net when they play. 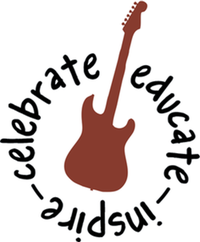 In the education world, it’s called known-to-unknown and it basically means that if you saw the end goal (the more difficult version of the song) and there wasn’t a clear path to that end, the student would be intimidated and psych themselves out or lock up. But if you took what they knew (basic guitar skills) and taught them the easy version of the song, they would know the melody, tempo, and feel and the end wouldn’t be nearly as daunting. The book costs only $9.95 and it’s worth it not only because it’s a great collection of Christmas songs that, once learned, you’ll be able to impress friends and family alike on a quiet night by the fire as snow slowly falls outside the window, but because it serves as an excellent example of an instruction technique that is just getting a toe-hold in education systems. That alone makes it worth it to me, but yeah, learning Christmas songs and sounding good is also pretty cool. And come on! It’s ten bucks! Just buy it and see what I mean. 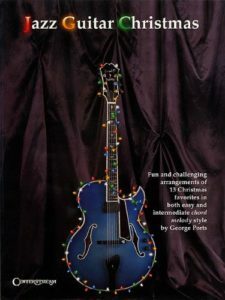 Jazz is most often not easy :)) But Jazz Guitar Christmas looks like a worthy book to spend some money on it!